Most pro fight fans pay little attention to amateur boxing. Every four years they may watch the Olympics and perhaps find a favorite whom they will follow on his journey into the pro ranks. It was in the 04 Olympics some of you may have spotted a Kazakh silver medalist by the name of Gennady Gennadyevich Golovkin, soon to be known in pro boxing circles as GGG. Having been involved in the amateur scene from the late 90’s I first came across Golovkin in 2001 in Osaka Japan when he defeated Daniel Geale in the welterweight final of the Asian Games. I was instantly a fan, following him through the 03 world championships in Bangkok to the 04 Olympics in Athens. In 2004 Golovkin was 22, an Olympic silver medalist, and perfectly set to join the ranks of the professional fighter. And yet for some reason he chose to remain an amateur for 2005, turning in below par performances at the world championship in China, and world cup in Moscow. So it wasn’t until 2006 at the age of 24 that Golovkin made his pro debut. Although not riding the same wave of success he would have 2 years earlier, I was excited when I noticed his name on the undercard of a Serhiy Dzinziruk fight. It was his 5th pro fight, and yet I was surprised at the level of competition. His previous opponent had a record of 1-10, his next 12-12. GGG was one of the best amateur fighters of his generation, and there was no reason for him to have any more than a handful of “acclimating to the pros” fights. He should have gone after the best at 160 almost immediately, and have been challenging for a world title in no more than 8 or 10 fights; instead he took 20. One of the problems with following the sport of boxing these days is having to deal with one eyed fans, who come to the party late (most know nothing of the amateur scene) and let loose with both barrels at anyone who offers up any sort of criticism of the fighter to whom they have pledged allegiance. Golovkin shouldn’t have fought 75% of the guys he fought. Uh-huh, that’s right. I said it. I meant it. I’m here to represent it. No matter what any of you think, unless GGG finds a way to get top level fighters in the ring, his legacy will be forever tainted – you see history is less concerned with how you beat an opponent than who it is you beat. The risk vs reward model has, in one form or another, always existed in professional boxing. If modern day boxing suffers from a malaise then surely it is this very model that is to blame. 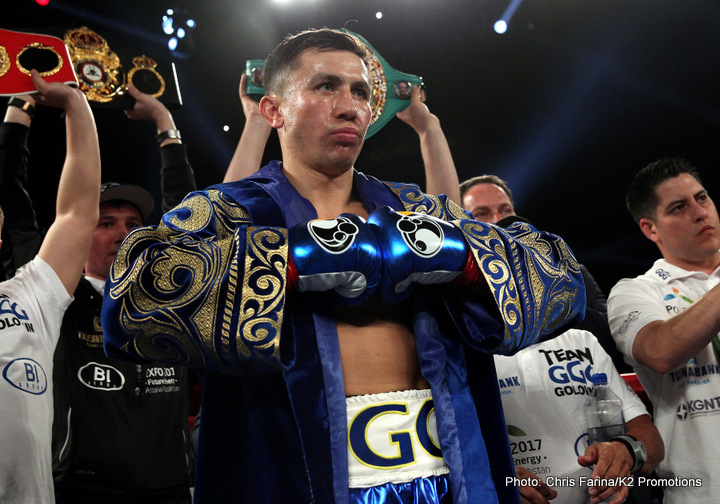 And it’s far from just Team Golovkin who’s guilty of using it – Khan has always used it. Kel Brook has one good opponent on his resume. Thurman has none. In fact one of the deepest division in boxing has, for years, been 147, and yet it is rare for those guys to fight each other. We soon get Porter v Thurman. And how sad is it that 2 top fighters in their division facing off, is so uncommon an occurrence that we await it with bated breath? What the modern promoter and manager and fighter fail to take into account, is that before Floyd and Pac started match making for ultimate reward at the lowest risk, they had paid their dues in the lower weight classes. When it came time to build a legacy and get paid accordingly, both rapidly moved up the weight classes to fight the then golden (goose) boy Oscar De La Hoya. And this is what we, the true fans of GGG want from him. With Froch retired and Ward at 175 only a short stay at 168 would be required and advisable. Fighters such as the Dirrell brothers, Badou Jack and Chunky Degale are better than anything at 160 and would both challenge and improve GGG’s resume; and then he just has to move up to 175. Move up and fight those light heavy weights that feature on the P4P lists – Ward, Kovalev and even Stevenson. Why should he move up; you rampant defenders ask. Hagler didn’t move up. And that’s true, however Hagler’s legacy (and pay day) fights were coming to him. Kovalev won’t have to move up either; it’s just the way it is. However the truest answer to the question why should GGG move up in weight, is quite simply, because he can. And it’s because he can, that he should. Golovkin can beat those guys, not definitely, it’d be a fight, make no mistake, but he could win. And that would be something special. And as fans of GGG wouldn’t we all much rather see him struggle to overcome Kovalev, Stevenson and Ward at 175 than walk through guys like Wade, Lemiuex and Monroe Jnr at 160?